David R. Boulware, M.D., M.P.H., ’96 had a manuscript published in the New England Journal of Medicine just yesterday: “Timing of Antiretroviral Therapy after Diagnosis of Cryptococcal Meningitis.” Click here to read a preview of the article. David is an Associate Professor at the University of Minnesota Medical School, with formal training in public health, clinical trials, and tropical medicine. He specializes in Infectious Disease/HIV. After Wabash David earned his M.D. at Indiana University School of Medicine, Indianapolis. Tom Thompson ’97 has joined the Duane Morris LLP Chicago law office as Partner. He is a trial lawyer with significant experience resolving insurance, accounting and professional liability disputes. 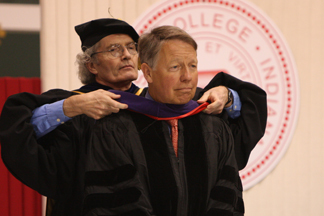 After Wabash, Tom earned his J.D. in 2001 with honors from University of Montana School of Law, where he was an editor of the Public Land and Resources Law Review. He was a Political Science and French major at Wabash. Photo courtesy of Duane Morris LLP. Former Football Coach Walter W. Gray ’41 will be inducted into the Class of 2014 Monroe County [Indiana] Sports Hall of Fame on July 11 in Bloomington, IN. He coached at Bloomington’s University High School from 1948 – 1967 and earned a PhD at Indiana University. Walt went from star athlete at Wabash to heroic service in World War II to a successfully long career coaching high school football. He left coaching to teach at Indiana State University, and was named to the Board of Directors of the National Transportation Advisory Committee. In 1999 he was buried in Arlington National Cemetery. Walt is a member of the induction class of 1994 Wabash College Athletics Hall of Fame for baseball and football. Click here to read the news story about Walt Gray and click here to find out more about the sports hall of fame event. Brandon Peacock ’04 has joined MainSource Bank in Crawfordsville as a mortgage loan originator, where he will expand mortgage lending and cross-selling other products and services. He has eight years of banking experience since graduating from Wabash. Brandon was an Economics major at Wabash and is a native of Crawfordsville. Congratulations, Brandon! Sun King Brewery is five years old! Click here to read an interview with father/son owners Clay Robinson ’97 and Omar Robinson ’60 as they recount the last five hectic, but fun and obviously successful years. They will celebrate on June 28 with music, food, and a new release, Grapefruit Jungle I.P.A. David Kendall receives honorary degree in law in 2010. David Kendall ’66 was part of Freedom Summer in 1964, when he worked to register voters in Mississippi. NPR’s Weekend Edition aired the story “50 Years Ago, Freedom Summer Began By Training for Battle” last Saturday. Click here to listen or read the transcript. 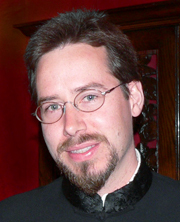 After Wabash, David earned his JD from Yale University and has since achieved a noted legal career, detailed in the citation in 2010 when he was presented with the Wabash College Honorary Doctor of Laws. Laura Frye, Associate Director of Financial Aid, is a member of the steering committee of the Montgomery County Education and Career Services Coalition, a network of local organizations interested in increasing college access and success for young people in Montgomery County. Last Monday, Montgomery County received an award at the Indiana statehouse recognizing its efforts to increase the percentage of county residents with education and training beyond high school. Click here to learn more about the Montgomery County College Success Coalition and the Indiana College Success Coalition initiative. Nick Roth ’88, himself father of two, just spent his first father’s day without his own dad since he died last summer. Rex Ryker ’97 has been named assistant superintendent of Crawfordsville Schools. He was the principal at Nicholson Elementary School for the last three years and was English teacher and football coach at Crawfordsvile High School prior to Nicholson. After Wabash, Rex earned graduate degrees in education as Educational Specialist and Educational System Administration, and is currently working towards a PhD in Educational Leadership and Administration at Indiana State University, with expected completion in 2015. Tom Hiatt ’70 has been named Chair of the Indianapolis Museum of Art’s Board of Governors. Previous positions with IMA Board since 2010 include Vice-Chair of Executive Committee and chair of the Development committee, and chair the 2012 search committee for the IMA director and CEO. Click here to read the news release. Tom is a founding partner of Centerfield Capital, a private equity firm in Indianapolis.